Since 1989 Karate has been a major part of my life, starting as an after school hobby then moving into a serious competitive sport and now a career. I have been involved in and tried many sports and activities but Karate has changed my life and given me the skills, discipline and focus to be highly successful in everything I put my mind too. 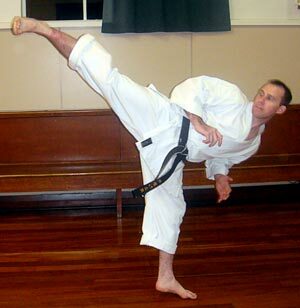 In 2000 I took over the Harewood Club as the head instructor and teaching became my primary role in Karate. This changed the way I saw martial arts training and everything became about enabling students to improve themselves, which I enjoyed immensely. In 2006 I turned my hobby into a full time job and started teaching one on one karate, Womens Self Defence, Control and Restraint classes as well as continuing the Harewood Karate Club. It was an extremely rewarding yet daunting move. Once I was established, expanding became the focus, opening secondary Dojo’s in Fernside and Darfield. With the already established Westport Dojo coming on board as well. I am very proud of what Take Control Limited and Okinawan Go Ju Ryu Karate has become and I also have plans for another club in the near future. Throughout my years of training the one thing that has annoyed me about martial arts is the politics and squabling that can occur. So I decided now as a 4th Dan Belt to be my own organisation where training is the main focus. Kids classes are fun and exciting while still having discipline and the adult classes are challenging and rewarding with the feeling of friends hanging out training together rather than military like highrachy that I have experienced by other instructors. I have found teaching far more rewarding than I could ever have imagined. Seeing people develop and grow through their involvement in karate has been an inspiration in itself. In 2013 I took 45 people on an amazing trip to Okinawa to train with the best instructors in the world. It was a fantastic trip in a beautiful place. So In 2016 I did in again, taking another awesome group of students and their families over to experience the best of the best karate training you can get. Also on the trip we were asked to be a Cooperative dojo with the Jundokan. The first step to be an official branch dojo of one of the homes of traditional karate. This was an amazing thing and I am so proud that our little club in NZ was given this honour. In 2014 when 9th Dan Masters Sensei Gima and Sensei Kinjo gave to New Zealand I was very honoured to be awarded my 5th Dan.